Note: This is not a complete reference but rather quick reference for those features that are (in my opinion) the most unclear. // This line throws a Win32Exception with "Ivalid window handle". Now, when the user closes the window (without using the mouse; eg. with Alt+F4) while the mouse is still in the window, the call to wnd.PointToScreen() (line 11) results in the Win32Exception above. Unfortunately, the doesn’t seem to be any way to check whether this exception will be thrown – I already tried Window.IsLoaded as suggested here with no luck. What’s more annoying is that the call to PointToScreen() does not appear in the stacktrace. I can’t even imaging how this is possible. That’s why it took me ages to figure this one out. Btw: I’d like to send a bug report to Microsoft but they haven’t got my account working in three months. The problem only arises on 64-bit Windows system. A correct exception is thrown on 32-bit systems. On 64-bit systems the Win32Exception can’t be caught in a try ... catch block. Both PointToScreen() and the point where the exception is thrown are on the same thread. I’ve managed to create a bug report for this problem. Unhandled Exception: System.IO.FileNotFoundException: Could not load file or assembly ‘TrackerInterface-Mixed-Full.dll’ or one of its dependencies. The specified module could not be found. 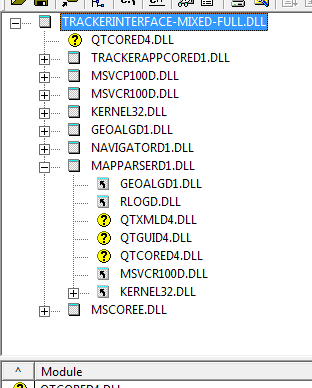 Here, it tells me that my DLL “TrackerInterface-Mixed-Full.dll” could not be loaded. The first thing I thought was that the application couldn’t locate this DLL – because of the FileNotFoundException. Unfortunately this wasn’t the problem. So I figured “or one of its dependencies” was the real problem. However, the error message doesn’t tell you what dependency (DLL) is actually missing – even when debugging. I hope this helps in case you’re running into this problem yourself. Note: The part “The specified module could not be found.” of the error message indicates some missing DLLs. There can be other reasons for getting a “Could not load file or assembly ‘Assembly.dll’ or one of its dependencies.” which then have other texts after this one. Note 2: This only seems to happen when using native DLLs from .NET applications/assemblies.